If you don't like something, eat it. March 3, 2018 May 15, 2018 ~ Steve N.
I adore spicy food. Spicy heat improves so many dishes that it’d take a book the size of the Bible to list them all. Even when used in small amounts to add a little background heat that most palates won’t detect as spicy, it’s an important element in cooking. Then there’s the nasal and sinus-clearing heat of super spicy dishes. I crave that tongue burning pain. It hurts so good! I love spicy food so much that I keep a small vial of cayenne seasoning in the lunch box I take to work at all times. One can never know when something will need a little hit of heat. You can imagine my excitement when I discovered that Hattie’s in Saratoga had put Nashville Hot Chicken on their menu. Nashville Hot Chicken is the stuff chili-heads like me dream of, and fried chicken is a great vehicle to deliver high amounts of heat that you’ll later regret eating. I was disappointed with Hattie’s version of the Southern classic, I was expecting better. I’ll explain, but first, what is Nashville Hot Chicken? What is it we’re supposed to be eating when we’re served the firey dish? The story goes that Thornton Prince III was a repeated womanizer, and after coming home from a night of ‘revelry’ (ahem), his then-girlfriend decided to punish him by serving him fried chicken that had ungodly amounts of hot pepper in it. It turns out he loved the super spicy chicken, so much so, that he and his brothers developed their own recipe and started selling the dish. In a nutshell, Nashville Hot Chicken is traditional bone-in fried chicken that’s either basted or dipped in a lard and cayenne pepper paste or thick sauce. The paste has so much cayenne in it that it gives the chicken a deep magenta hue. It’s traditionally served on plain white bread, with pickles. 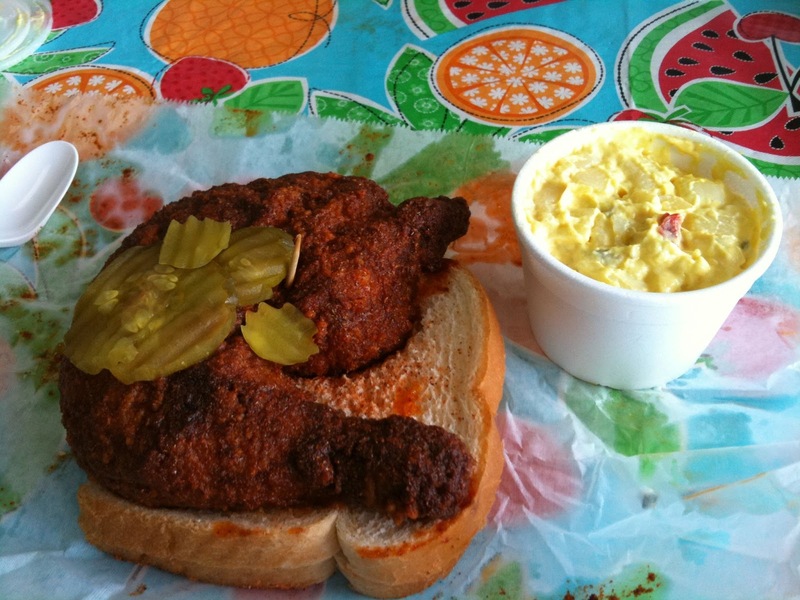 Here’s a photo of Prince’s Hot Chicken, the purported creator of the dish. Notice how deeply red the chicken is. Here’s what I was served at Hattie’s. What Hattie’s is serving is delicious. But, this delicious chicken is not Nashville Hot Chicken. The heat level is far too low. There’s not nearly enough cayenne, as evidenced by its yellow/brown color. If you look closely, you can see the cayenne sauce on the plate, it’s barely pink. The chicken is about as spicy as the typical ‘hot’ wing sauce countless bars serve. I had high hopes that if anybody locally was going to get Nashville Hot right, it would be our nationally famous, premiere chicken joint. It’s important that Hattie’s get it right, and not serve a dish that is Nashville Hot Chicken in name only. 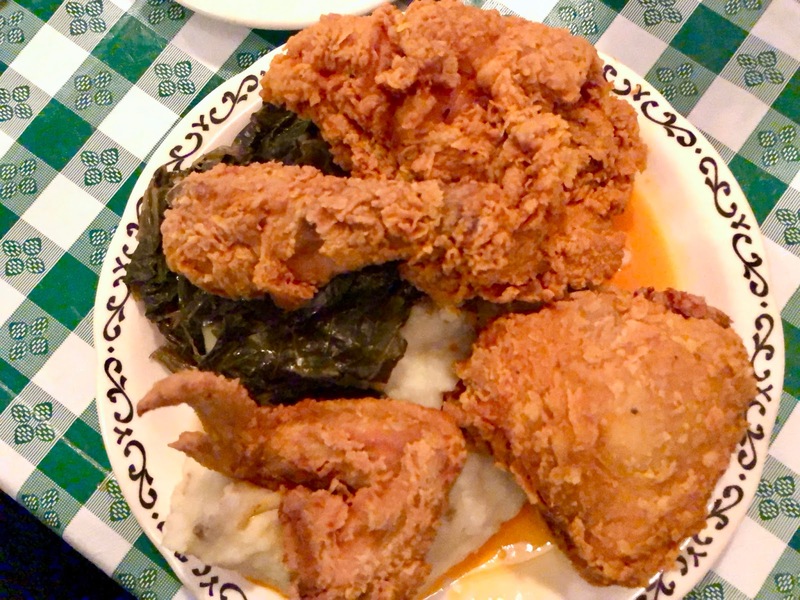 Hattie’s is on more ‘best fried chicken’ lists than I can name. They’re known the country over for their chicken. I got the impression that Hattie’s is just phoning it in to capitalize on the dish’s current popularity. It gives the impression they don’t take the dish seriously. Hattie’s needs to reboot this dish. At a minimum, it needs to be spicier. A lot spicier. I’d suggest they offer three heat levels; medium, hot, and extra hot. Those with timid palates can order the medium, and heatseekers like me can get the extra hot and blow our eyeballs out. I’d also like to see them serve it the traditional way on white bread with pickles, and make the sides optional. Hattie’s is special. The area would be worse off if it were to go away. The fried chicken there is indeed excellent, and its place on best of lists is well deserved. But, Chef Jasper’s interpretation of Nashville Hot Chicken is a miss. View all posts by Steve N.
If you are serving Nashville Hot Chicken at three different heat levels, shouldn’t they be hot, mild, and extra mild? With extra mild still being plenty darn hot? I’m an IT Professional who is also an avid home cook, and a (somewhat) discriminating food geek.